XML stands for eXstensible Markup Language, which allows structured data to be stored in text format, and is a world-wide standard promoted by http://www.w3c.org. Whilst a plot is typically created from an REP file, it may not be saved back into that REP file - it must be saved as a Debrief Plot-File ( DPF). To save your work as a DPF file, click on the Save button: on the Workbench toolbar (or via the File menu). A file dialog will open (see below), allowing you to save the current session in this format. 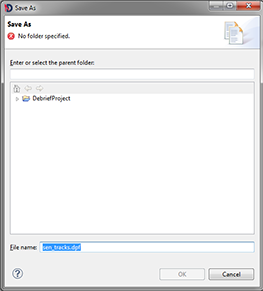 Debrief will only let you save the new plot into one of your project folders, so you must both select a folder and a provide a filename for the new file. Usefully, Debrief guesses that you probably want to name the plot the same as the REP file first loaded, but you can change this as required. Save-as functionality is provided through the Save As button, next to the Save button in the File menu. Debrief plot files can grow very large, and on occasion the memory required for the save operation can reach the upper limit provided to the application by default. When Debrief fails during the Save operation due to reaching the upper memory limit it stops trying to save to file and shows a message dialog advising you to increase the limit:“Ran out of memory whilst saving plot, try adding -Xmx256m to the command line”. This extra parameter passed when Debrief is starting instructs your PC to provide Debrief with 256 Megabytes of memory. If you continue to receive the error message try increasing the memory allocation to 512 Megabytes. The save operation itself is conducted in a two-stage process. If the operation entails saving over an existing file (when you just do a plain Save, or Save As over-writing an older version) Debrief first writes the plot to a subtly different filename in the same directory (plot.dpf would get saved to ~plot.tmp). If the save operation completes successfully then the older file is deleted and the temporary file renamed to the originally requested filename. Thus, your existing file only gets overwritten on successful completion of the save.